View of “Leontine Arvidsson,” 2017. Leontine Arvidsson’s second solo exhibition at this gallery emphasizes the actions of overlapping and layering, as opposed to erasing or rejecting, to create successful works. Failure here is viewed as either an obsolete or merely subjective idea. Most of the pieces displayed have a quality that leaves one feeling as if they are in the midst of construction or a process that slowly morphs with quiet tenacity. In times like these, the means prove to be more significant than the ends, since resistance is often effected through incremental gestures and decisions that compile over time. 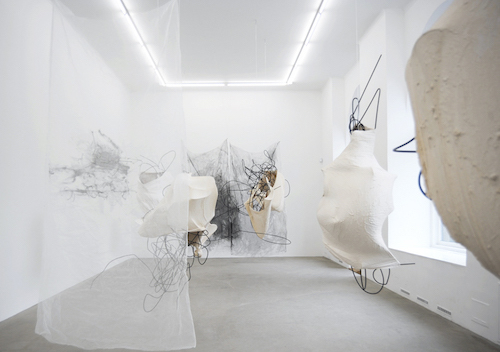 Her new three-dimensional sculptures and paintings are exhibited in two conjoined rooms. The first introduces a chorus of sculptures (consisting of rebar, tarlatan, and Acrystal) that represent eleven women who have worked as assistants for Arvidsson, such as Johanna 20/12/16 (all works cited, 2017) and Chu Chu 21/1/17. The second, smaller room exhibits a singular large-scale sculptural installation titled Med Omsvep, which sprawls up the rear wall and onto the floor in a feral manner. All of these pieces are distinct, yet together they resemble a thick forest or tangled seafloor—if one chooses to think of the installation as a direct reflection of nature or tribute to organic life. Though they refuse symmetry, one might detect an inherent grace in their delicate idiosyncrasies.